Designed for bigger guys who demand comfort in the field, this ComfortQuest Big Boy Sport Chair is truly a must-have. It's made from heavy-duty reinforced aluminum and features a generous 18x24" seat with 2" padding that will keep you comfy from sunup to sundown. Plus, it's built on a silent swivel that rotates 360° and is height adjustable from 13" to 18". 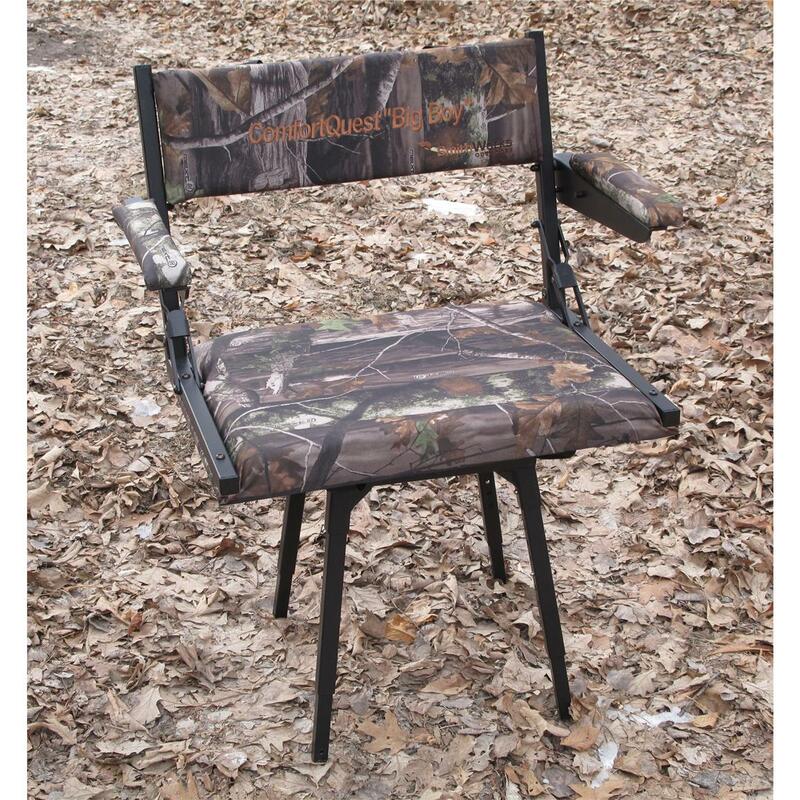 Legs are height adjustable from 13" to 18"
Seat dimensions: 18" x 24"
SmithWorks Outdoors ComfortQuest Big Boy Sport Chair is rated 4.4 out of 5 by 7. Rated 5 out of 5 by fisherus from Pricey but Strong for the Big Uns! I tried this chair out for months at my computer desk before entertaining hunting again and ended up purchasing two ground blinds to hunt my property in.I am a partial paraplegic, suffering the loss of feeling below my knees from poor outcomes of seven lower back surgeries. I gained most of my weight because of the lethargic lifestyle I am compelled to live but with diet have lost quite a bit. 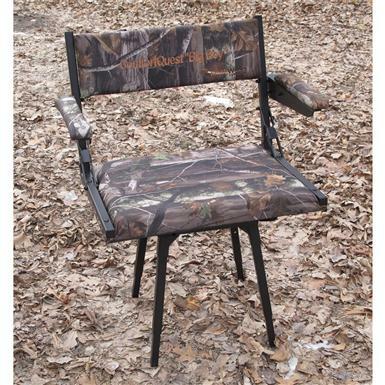 I loved this chair and felt it was going to be the thing to allow me to hunt deer again but, sadly I never got to try it hunting.A thief stole all of my tools and hunting equipment (including the chair and two new blinds) out of my shop while I was in the hospital having my toes partially removed. I can't afford to purchase another one at this time but recommend it to those of you that are needing smething super strong and comfortable. Rated 5 out of 5 by Kwiksdraw from Great heavy duty chair. Very well made. Adjustable legs for uneven ground. Assembles and disassembles easily. Carry bag is durable. It is somewhat heavy, but that speaks to the quality. Rated 5 out of 5 by BigBill from Big & Comfortable This is the nicest heavy duty comfortable outdoor chair that I have found yet. Sturdy, quiet and packs well. Not the lights chair, but in my opinion by far the best I have found! Rated 3 out of 5 by A Fat Boy from Oversized chair Am some what disappointed for the amount of money it cost. The chair isn't comfortable to sit in. It bothers my back. One of the arm rest was bent and not seating properly. They had some good ideas, just needed better engineers. There are not a lot of choices on the market, that I found anyway, for big guys. I am 6' 3", 325lbs. So I guess I'll have to deal with it. It not terrible, but like I said, I expected better quality for that price. Rated 4 out of 5 by wallygator from I'm a big boy and have plenty of room. Like the caps 4 the legs so they don't sink into the ground. Swivels easily. Maximum comfort from sunup to sundown!